Anna Aleksandrovna Vyrubova (nee Taneyeva) was born on July 16, 1884, and died in Helsinki, Finland on July 20th, 1964. She was one of three children of Aleksandr Sergeievitch Taneyev, a composer, and his wife, born Nadezhda Illarionovna Tolstaya, (a cousin of author Lev Tolstoy and a direct descendant of Field-Marshal Prince Kutuzov). Anna Aleksandrovna grew up very close to the Court because of her parents’ cultural and aristocratic connections, and as a young woman, Taneyeva was made a “Frelina” or lady-in-waiting of the suite of the Empress. 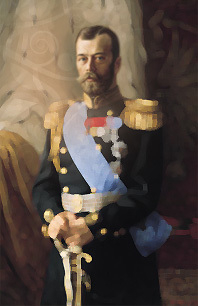 Quickly forming a friendship with Empress Aleksandra Feodorovna, Taneyeva increasingly became a part of the immediate family circle which surrounded Tsar Nicholas II. Noted by her friends as unpretentious and good-natured, and by her detractors as “not at all intelligent…and rather sly”, Taneyeva nevertheless became an intimate friend of the family. Anna was married to naval officer Alexander Vasilievich Vyrubov. The marriage was deeply unhappy, and ended in divorce. This miserable situation drove Mme. Vyrubova deeper into the bosom of the Imperial family, making her privy to their secrets and a beneficiary of their rarely given personal trust. Her unprecedented access gave rise to many rumors. Though in her memoirs which follow, Vyrubova denied these allegations, she remains credited with introducing the Empress to the monk Rasputin, and vilified accordingly by Imperial Society. Vyrubova trained with the Imperial family and served as a nurse during the First World War. After the Revolution, she was arrested by the Bolsheviks and endured prison and trial, but was finally released, escaping to Finland in 1920. Taking vows as a nun, Vyrubova wrote her memoirs of life with the Imperial family. These memoirs are, like so many contemporary accounts, as obfuscatory as they are revealing. Vyrubova’s work, however, is still a seminal one, providing us with rare insight into her years in the service of the last Imperial Family, and into the characters and personalities of the family she knew better than anyone.